This book is incredible! I first read “Desert Solitaire” and so I imagined E.A.’s writing from his nonfiction which was great, but nothing like his imaginative storytelling. 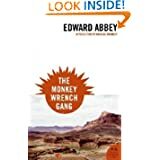 “The Monkey Wrench Gang” is an exciting and classic adventure, it’s instigating, inspiring, thought-provoking and offers an honest (if idealistic) glimpse into the “radical environmentalist” sabotage culture from the 70s. I particularly enjoy his detailed knowledge and descriptive prose that brings the book to life and educates you in the process. What more can I say? Read it! What a wonderful book!